Home Headlines TORG Eternity is Back on Kickstarter! It launched on Tuesday, March 27 becoming funded in 21 minutes, hitting over $50,000 in less than three hours, and to date has so far broken 37 Stretch Goals. This Kickstarter ends on Tuesday, April 24. Last year the release of TORG Eternity on Kickstarter was a rocketing record setting event. By the end of the campaign it logged in at over $355,000 pledged. This made it the number one, largest Kickstarter of an RPG launch in 2017. In addition to that TORG Eternity also received a nomination for 2017 Golden Geek Award for Best RPG of the Year and already is a Top 100 Product on DriveThruRPG. Now TORG is available again on Kickstarter. This time with The Living Land supplements AND with another opportunity for backers to get the wildly popular monstrous Cargo Box, with all the stretch goals from the original Kickstarter included. “There was such a huge outcry from people who missed the first TORG Kickstarter that it became sort of a moral imperative to offer again the Delphi Council Cargo Box with all its Kickstarter rewards”, explained Darrell Hayhurst, TORG line manager for Ulisses. Missed it the first time around? Get the monstrous TORG Eternity Cargo Box from the original Kickstarter (contains the bonus stretch goals for original Kickstarter pledge, as well). The original Cargo Box isn’t available through normal channels, so this is your chance to get it. Don’t miss out! Have the TORG Eternity Core rulebook? Then get the Living Land Survival Box. It includes all the Living Land goodness that you’ll want for this COSM (campaign setting), plus a host of unlockable physical stretch goals. Want it all? 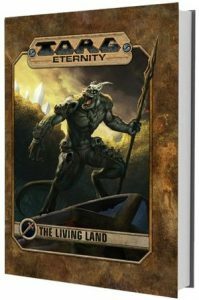 Get TORG Eternity and Living Land: All In. Perfect for those who missed the original TORG Eternity Kickstarter and want to make the most of this one. Contains the Living Land Survival Box and the TORG Eternity Cargo Box. The Living Land is a realm of primitive peril, savage sensuality, dangerous dinosaurs, and the invading Edeinos hordes (humanoid reptiles, with long tails and snouts). The Living Land supplements offered in this Kickstarter help you continue and expand your table-top role-playing game experience in the evolving world of TORG Eternity. There are amazing opportunities scattered among the Living Land’s perils. The Law of Wonders insures that lost treasures appear in the misty and unexplored jungles. These treasures might have disappeared from Earth long ago or they may be relics from COSM destroyed by the High Lords. Whatever their different origins, they are resurfacing here and now, for any adventurers bold enough to discover them! The Living Land is an amazing, in-depth addition for immersive play in TORG Eternity. TORG is a classic that’s returned with the great setting that made it famous, but with new modern style runs that make it more fun to play than ever. It’s now called TORG Eternity. There is absolutely no game setting like multi-genre setting of TORG Eternity. There is amazing choices for players to control and create their characters. Thanks to the many celebrated game designers that created the game mechanics, it has extremely fun game play. It is truly unique. Check out the current Kickstarter for more details and videos about TORG Eternity.